As experts in metal plating and metal finishing, we also offer high temperature heat treatment solutions. Our heat treatment services expose metal coatings to high temperatures for sustained periods, diffusing the electroless nickel layer onto the steel. These treatments optimise the mechanical and physical properties of a coating for a given application. Exposing metal coatings to heat treatment solutions gives them a degree of flexibility. It’s a common misconception that heat treatment is a process for hardening metal, as many heat treatments are applied to soften metal in order to allow metal working operations such as deep drawing, cold forging and machining. The heat treatments at us can be used for stress relieving and de-embrittlement as both pre-plate and post-plate treatments. Luckily, the heat treatment process does not affect the increased corrosion protection offered by an electroless nickel deposit. Even the smallest of components can be heat treated. We load them onto shelves to maximise the heat treatment capacity and minimise the cost of the treatment for our customers. The staff at us use chart recording equipment to monitor the temperature changes of both the furnace and the work. This enables us to create heat treatment profiles which determine shot blasting solutions for many different requirements. Our monitoring also ensures the material achieves the required temperature for the required time, in turn eliminating heat sinks on larger components or mixed loads. The UK’s industrial sector has received a significant boost thanks to an increased output of oil, gas and manufacturing. The Yorkshire Post has reported that industrial output grew at its fastest rate in six months in March, after an unexpected bounce in oil and gas extraction. Official data from the Office for National Statistics has showed that industrial output rose 0.5% in March, after creeping up by only 0.1% in February. This is the strongest growth since September, and has exceeded leading economists’ forecast of that it would remain the same. Oil and gas extraction rose to 4.9%, which was its fastest rate since February 2014. Falling oil prices and rising production costs as North Sea oil gets scarcer had previously contributed to a general downward trend. Britain’s economy grew by 2.8% in 2014, the fastest growth rate of any big advanced economy. It did lose pace in the first quarter of 2015 when total output rose by just 0.3%. However, recent data shows that manufacturing output rose by 0.4% after upwardly revised growth of 0.5% in February, which was slightly faster than expected. Here at us, we carry out a significant amount of metal plating work for parts and components to be used in the oil and gas industries. A common requirement for plated components used in these industries is their ability to resist corrosion for a substantial amount of time, especially in subsea conditions. Our commitment to research and development allowed us to create SeaTEC100, a metal coating that protects mild steel from salt spray corrosion and marine corrosion for an extensive period of time. SeaTEC 100 has been independently tested to withstand salt spray conditions for over 25,000 hours, a period of time that is unprecedented within the engineering industry. The offshore oil and gas industry is facing a radical reform with regard to the way that the industry is taxed. The UK government plan to move away from their previous focus of maximising revenue for the Treasury, admitting that the new burden of maximising extraction will mean a lower tax burden. The treasury minister announced on Thursday 4th December that this new support for the industry will provide economic benefits for years to come. These radical reforms will mean that the tax burden on the oil and gas industry will be lower, encouraging investment in the North Sea, and providing significant economic benefits for the UK for the future. The reforms include the implementation of a basin-wide investment allowance, designed to reduce the tax rate for companies investing in the future of the UK Continental Shelf. This will be in addition to tax concessions announced in the chancellor’s Autumn Statement, which included an immediate cut in the supplementary charge element of offshore tax, from 32% to 30%. There will also be more flexibility in tax allowances for companies that haven’t yet seen an income from their investments. Furthermore, the government has committed to boosting offshore exploration through supporting seismic surveys in under-explored areas of the North Sea. The changes to the tax regime follow the recent review of the sector by Sir Ian Wood. The review recommended a new regulator, and a requirement that the industry, government and that regulator should be co-operating more closely. us are pleased to announce the latest of our new metal plating services available; nickel diamond plating! We’ve got a wealth of experience in the processes of electroless nickel plating, copper plating and metal finishing, so nickel diamond plating is a natural extension of our quality range of services. What is Nickel Diamond Plating? Nickel diamond plating combines an electroless nickel deposit with fine particles of diamonds. A variety of substrates can be coated using nickel diamond, including metals such as carbon and tool steels, aluminium, alloys, copper, brass, bronze, stainless steel, and titanium. The use of diamond particles contained within an electroless nickel coating offers a practical and affordable way to utilise the properties of diamond on the surface of components. What are the Features of a Nickel Diamond Coating? Nickel diamond coatings provides a highly corrosion and wear resistant coating. By providing maximum protection to the surface of the substrate, coated machinery parts will have an increased lifespan. This helps to keep maintenance and related downtime due to the replacement of high wear parts to a minimum, reducing costs. Due to the electroless chemical method of deposition, nickel diamond plating is able to cover surfaces with perfect uniformity. Therefore, regardless of the geometry of the component, the nickel diamond coating creates a uniform deposition on all areas of the part, even on recesses and holes. Here at us, we’ve recently been involved in an exciting project copper plating part of the bar for use at Lord’s Cricket Ground. Situated in St John’s Wood in London, Lord’s Cricket Ground is often referred to as the ‘home of cricket’. Of course, it’s such a busy bar that it has to be very large to accommodate everyone, and make sure that everyone gets served their drinks in a reasonable amount of time. To make sure that this happens, the bar staff at Lords pour pints of beer from allocated drink stations along the bar, which can then be passed to members of staff serving customers in order to save time. The piece that we have copper plated is used to conceal the plastic pipes that the beer travels through as it is pumped up and down the bar. Because of all the pouring stations, there are obviously lots and lots of pipes that pump the beer down to them, and they needed to be contained in a way that was not only practical but looked good too. As you can see, the piece is long and circular, perfectly designed to hide the pipes. We think that the copper plating creates an aesthetically pleasing feature which will look really good at the historic cricket ground. The pictures show a section of the copper plated surround, several of which will be fitted together to make up a 25 meter length tube that will run from one end of the bar to the other. As you can see, the parts have been copper plated separately for ease of handling and transport reasons, and will be fitted back together once it arrives at Lords and then assembled at the bar. As experts in copper plating, we’ve noticed that the process has become more and more popular for decorative applications. A copper plated surface is generally very bright and shiny, therefore it’s a really attractive option when it comes to metal plating. In addition to the appealing look of a copper plated surface, it also naturally kills bacteria, which makes it perfect for us in the food and drink industry! As experts in electroless nickel plating, us have taken on some great projects over the years, as well as working with some really fantastic companies. In the past we have been lucky enough to do some work for Meggitt, a global engineering group specialising in components for extreme environments and smart sub-systems for aerospace, defence and energy markets. Meggitt are a FTSE 100 supplier of aircraft parts, and they supply flight displays and wheels to both Boeing and Airbus. Our job was to pickle a stainless steel component for a project located in offshore Brazil. We were lucky enough to be involved in the project due to our experience working with hydofluoric acid, which requires safety procedures that we are familiar with. Using this type of acid was integral to the process we carried out for Meggitt, therefore we were an obvious choice to help with it. Hydofluoric and nitric acid was used to remove the discoloured scale from the stainless steel component, and as you can see from the pictures, the process makes a huge difference to the surface of the steel.The component on the right in this image shows what the steel looked like before the process of pickling, and the component on the left shows the finished result. If you would like more information about us’s experience working with substances such as hydofluoric acid and stainless steel, please don’t hesitate to call us on our phone number or email us at info@metal-finishing-company.co.uk. Alternatively, you can click here to visit the us website. When you bought your metal garden furniture it looked fantastic, right? You couldn’t wait to sit out in your garden, lounge around on your new chairs, or lay your gorgeous new table ready for a BBQ. But after a couple of years exposed to the elements, it’s not looking so good anymore. You can’t sit on the chairs without getting rust marks on your clothes, and you’re using it less and less as a result. Well you’re in luck, because us have come up with the perfect way to restore garden furniture to its former glory, without having to buy a whole new set for a small fortune! The process of chilled iron shotblasting is the perfect way to clean up your garden furniture, remove all the rust, and make it look brand new again. We have used chilled iron shot blasting for all sorts of restoration projects, from car restoration and repair, garden furniture restoration and steel window frame restoration. It’s also a great way to restore any metal component that has deteriorated over time. Chilled Iron Shotblasting is the perfect process to clean all types of metal as it will effectively remove paint adhesive, plastic/rubber insets, grease and rust, leaving the component ready to be restored as required. Electroformed, electroplated and electroless nickel is commonly used in the automotive industry. One of the biggest and most obvious uses of nickel is the use on bumpers, wheels and grilles. 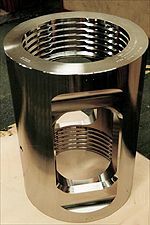 The use of nickel plating on parts such as these is partly due to the fact that it looks good with its shine and bright finish. But nickel also provides excellent corrosion resistance, durability and wear resistance, as is often demanded by makers of vehicles. Nickel plating is a great way of metal hardening and can protect components for decades, which is obviously great news for the automotive industry because it means that manufacturers can offer industry warranties. High quality plated components can be produced in bulk, with consistency and reliability. The automotive industry is the biggest user of nickel for plating applications. Steel bumpers are very popular as they look great, and they are also very durable. Substrate materials include steel, aluminium and plastic. The benefit of using nickel plating on substrates such as these is that they are relatively cheap, and with a layer of nickel plating they can be made extremely durable. Nickel plating lightweight materials such as aluminium and plastic is also beneficial because lightweight parts on a vehicle improve fuel efficiency. It’s also better for the environment for parts to have a longer life as it reduces scrap. Also, plated components can be recycled, which is good for the European auto industry as their objective is to produce vehicles that are completely recyclable. If you would like to find out more about metal hardening and metal corrosion protection, or the use of nickel plating in the automotive industry , why not ‘Like’ the us Facebook page or follow @nickelplating on Twitter for regular news, pictures and case studies. The last few months have been a really exciting time here at us. The new laboratory is finally finished and it has made a dramatic difference to the way we run the business. Before the lab, nickel plating jobs often took up to 2 weeks to complete, because we had to send samples off for testing before returning them to the customer. But now we have a brand new lab and we can do this testing in-house, which has reduced our lead time to 24 hours! It really is a massive improvement on the turnaround time of our work, and in turn benefits customers a great deal too. The new lab has the facilities to perform all the tests that verify hardness, phosphorus levels and diffusion layers. We have also invested in a Mitutoyo Micro Hardness Tester and we use colour metrics to measure the phosphorus levels of diffused nickel. If you have a project that requires a fast turnaround for your plating needs – we can meet them! For more information about our new laboratory and the positive impact it will have on your metal plating order, please call our phone number or email info@metal-finishing-company.co.uk.